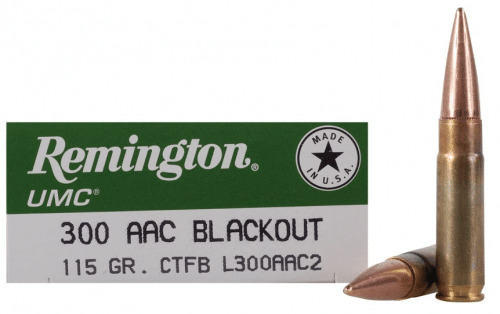 300 Blackout is the newest 30 caliber round to reach the AR 15 platform. The 30 caliber as a projectile size is nothing new. It’s been around for well over a hundred years and served in dozens of different countries. The 300 Blackout may be the bell of the ball in rifle calibers these days, but it has a lot of rounds behind it. 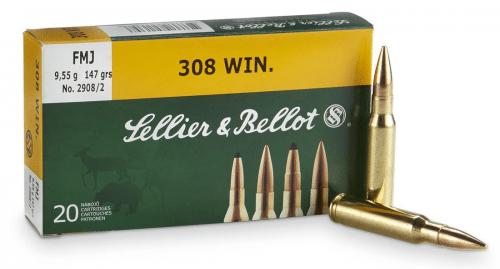 One of its primary competitors in the 30 caliber realm is the 308 Winchester. 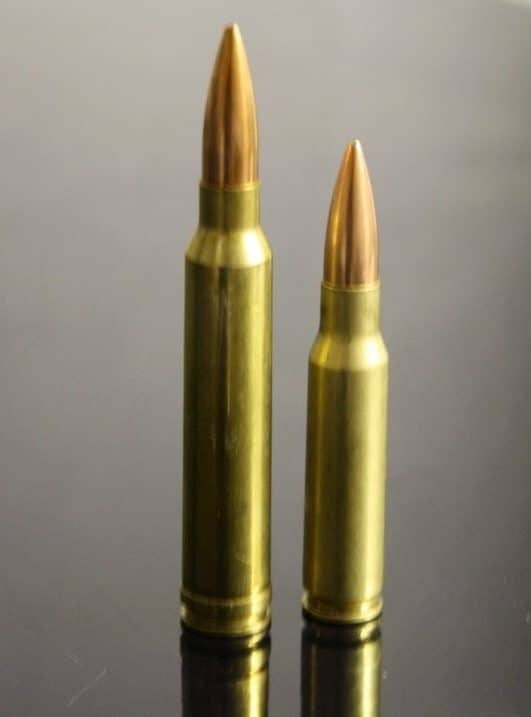 The 308 is a few decades older than the 300 Blackout round and evolved from the classic 7.62 NATO cartridge. The 7.62 NATO round is in service with hundreds of countries including the United States military. If you are looking for a 30 caliber rifle the 300 Blackout and 308 are the two current biggest competitors. So without further introduction let’s get down to the contest, the 300 Blackout vs 308. The 308 Winchester is a full powered rifle round that was designed in 1952. It case length of 51mm and uses a 30 caliber projectile. Light loaded rounds like a 125 spitzer round cna reach speeds of 3,100 feet per second. The 300 Blackout is derived from the 300 Whisper and received a SAAMI spec in 2011. It’s designed for use in short barrels and with a suppressor. It uses a 35mm case with a 30 caliber projectile. A 125 grain spitzer round can reach 2,215 feet per second. When it comes to these two rounds you have to ask yourself what type of rifle are you looking for. Both calibers have more traditional hunting rifles and tactical rifle selections. These two categories have some overlap, but I’m going to break them up into two categories for this article. Both rounds have a variety of options in the semi auto tactical realm. The 308 has older battle rifles like the G3, the FN FAL, the M1A and of course the AR 10. These rifles were designed when the full powered rifle round was standard among military forces. Outside of the AR 10 these rifles are a bit dated in design. They tend to be heavier and more reliant on iron sights than optics. The AR 10 is one of the most modern options that’s adaptable and modular. The AR 10 is likely the most affordable and easiest to find tactical rifle in 308. Since the 300 Blackout is so young it hasn’t found its way into a ton of different rifles. It was designed for the AR 15 and that’s the most common rifle you’ll find it in. The 300 Blackout has found its way into other semi-auto designs but they tend to be expensive and difficult to find. The AR 15 platform is likely the most affordable and common rifle you’ll find in 300 Blackout. The 308 wins here hands down. Being so old and so potent means there are hundreds of different hunting rifle options. This includes bolt actions, single shots, lever actions, semi autos and likely some I’m forgetting to mention. Every major hunting rifle manufacturer is going to produce their rifle in 308. The classic round has given hunters a wide selection of rifles. When it comes to hunting rifle in 300 Blackout you are limited to a degree. Companies like Remington, Savage and Ruger do produce some nice bolt action 300 Blackout rifles in their more popular lines. 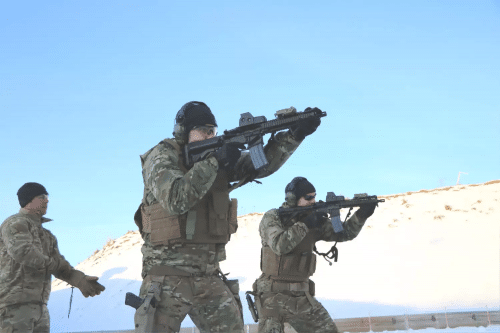 These rifles do tend to be lighter and shorter than a 308 rifle. The 308 is going to offer a larger selection of rifles… for now. The 300 Blackout is becoming more popular and we are likely to see more rifles being chambered in the round as the years go by. Range categories are difficult to judge because shooters have different needs. Right off the bat I can say 308 wins when it comes to max range potential. However this may not be a major consideration for you. The 308 round is by far the better choice if you want to engage at longer ranges. Good shooters can ring steel at 800 yards without an exceptional amount of difficulty. With the right setup, the right ammo, optic, and bipod you can be a long range force to be reckoned with. 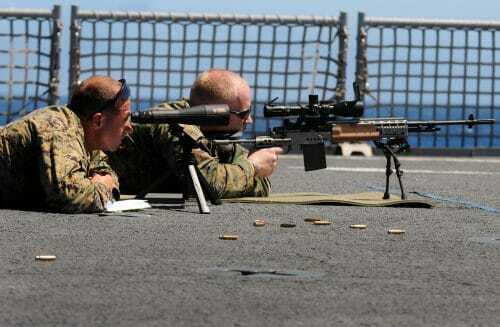 The 308’s cousin the 7.62 NATO is the most used round by military and police snipers. It’s also found its way into medium machine guns around the world. The 300 Blackout in the right hands can ring steel out at an impressive distance. When you take projectile energy into account the max effective range peters out at about 460 meters with a 125 grain projectile. If start shooting heavier projectiles you’ll start losing significant range. The 300 Blackout is better used for medium and close quarter shooting. So the real question is what range do you need to hit a target at? Let that determine the round choice. Like the long range category I can tell you who wins this category right off the bat. The 300 Blackout is much easier to control. Also just like the long range category you need to determine just how much controllability you need. If you compare a 300 blackout round to a 308 round you’ll notice immediately how much shorter the 300 Blackout is. This is due to the fact it’s designed for carbine platforms and the 308 is designed for full power rifle platforms. The shorter cartridge has less powder and therefore less recoil. The 300 Blackout is also going to offer shooters reduced muzzle rise. When you start shrinking guns to SBR lengths you still get an extremely controllable platform. You have minimal muzzle blast and flash. The 300 Blackout is designed for short barrels so as you go shorter you aren’t losing much performance. The 308 being a full powered round means you do get that increased range, but the cost is decreased controllability. The most obvious is going to be the massive increase in recoil. 308 rifles hit hard, and they hit back to. In a supported position it’s not so bad, but once you take an offhand position you’ll begin to notice that increased recoil. You’ll also really feel that upward muzzle movement once you start pulling the trigger. The rifle will buck and jerk trying to find its way out of your hands. One shot isn’t so bad, but trying to rapidly squeeze off more than 1 round rapidly is a challenge. Once you start decreasing barrel length you’ll start to see a noticeable increase in recoil, muzzle rise, and general controllability. 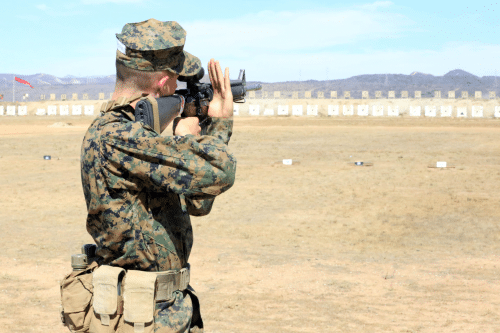 Choosing any rifle based on caliber is really going to depend on how you’ll want to use the rifle. Both calibers are overall outstanding for what they’re designed for. Both are far from cheap, but they deliver spectacular performancer in their intended roles. When it comes to hunting I’m going to suggest the 308. The 300 Blackout isn’t bad for hunting, but doesn’t offer the same versatility as the 308. The 308 is perfect for coyote, deer. elk, and even some bear species. The 300 Blackout is best kept to small and medium game like coyotes and deer. If you are recoil sensitive then the 300 Blackout is the best choice for you. The 308 offers more power, better hunting ammo selection, and longer range. When it comes to home defense the 300 Blackout is easier to use. Inside a home there is no need for long range power. 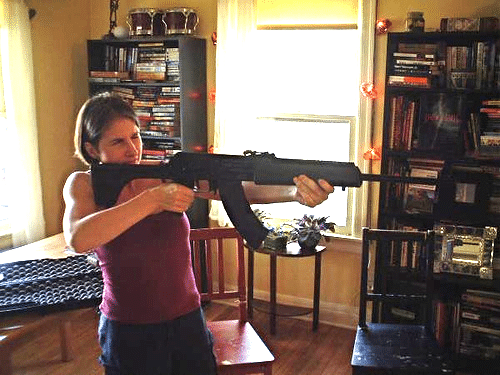 The 300 Blackout controllability is its strength in a home defense situation. You can put more rounds out, faster, and more accurately with the lighter 300 Blackout. Also in terms of rifle selection 300 Blackout guns are lighter, and shorter. This makes them the better choice for close quarters use. Duty use is a broad category and it really depends on the role the gun is being used for. If you need a short range room clearing carbine the 300 Blackout is of course the better round. The 300 Blackout is perfect for a cruiser rifle. 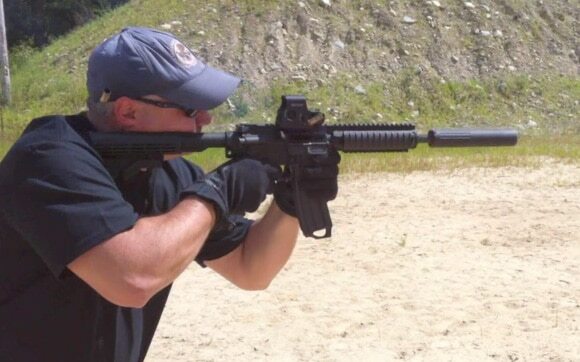 The 308 is better suited for police and military snipers. It’s power and long range potential make it better suited for roles where accuracy and power are key. If you want to run a suppressor aka a silencer then the 300 Blackout is for you. It’s designed to be versatile and to run with both supersonic and subsonic rounds. When loaded with subsonic rounds the lack of a supersonic crack makes it remarkably quiet when used with a suppressor. 300 Blackout rifles are designed to be suppressed and function reliably suppressed. 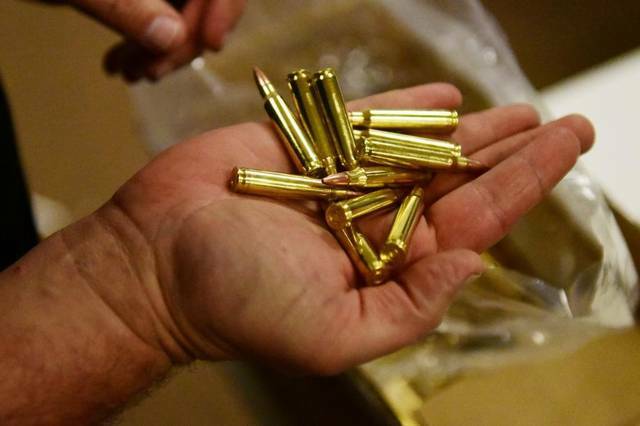 There is almost never a clear winner when it comes to choosing ammo. There are just so many situations and personal factors to consider it’s hard to say one round is better than the other. To really choose one or more you need to look at your needs. Your needs will identify what round will work best for you. Choosing ammo is always a personal choice.